Situated in the heart of the renowned golfing country on the East Lothian coastline neighbouring Gullane, Muirfield and North Berwick Golf Clubs. There can be few more stimulating courses than Luffness New. 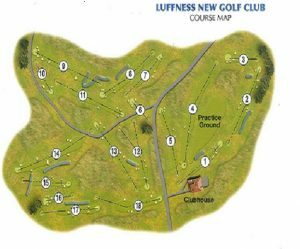 A challenging traditional links course which offers a true test of golf without being the longest of courses. There are no island greens surrounded by water, lakes on every hole or a succession of problems far beyond the average player. The course can be hard – mighty hard – when the wind blows down the Forth and the rough is thick enough to whet the whistle of a hungry herd. There are distinctive bunkers too but, like all great courses, Luffness rewards the virtues of accuracy and patience. The fairways are beautifully kept, and the golfer who can keep the ball down the middle will find little to worry him, but there is plenty of trouble in store for the wanderers. The bunkers are placed fairly to punish the errant shot and furthermore they are constructed to penalise severely those who cannot get the ball in the air. The greens are small and true and always in excellent condition. The course measures 6502 yds, Par 70, SSS 72 from the blue tees, a reasonable figure on a calm day, but very tight if even a slight wind blowing. On Scotland’s coasts, wind can be an incalculable hazard, and the caddies have been heard to say “It will take you three to be up there in two today, Sir” – the second, ninth, eleventh and eighteenth fall into this category. The long fourth hole (572 yards) is a very good hole of its type with a deceptive hollow in front of the green calling for a well-judged approach. The eighth and twelfth holes also merit a special word of praise for their attractive layout from the tee. The fourth and twelfth greens are situated close to the clubhouse; members are thus able to play a number of permutations without having to walk back from the country. The club is mindful not to rest on its laurels and is always on the look-out for how to improve the course and currently a new green is being constructed on the 15 hole. This will probably not be brought into play before 2019 at the earliest.